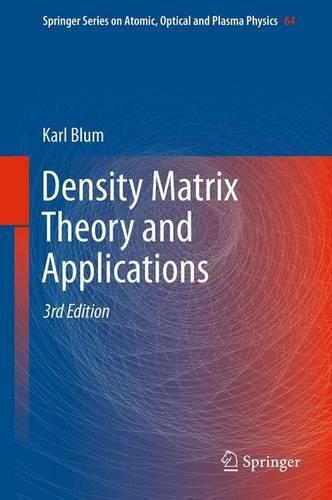 Written in a clear pedagogic style, this book deals with the application of density matrix theory to atomic and molecular physics. The aim is to precisely characterize sates by a vector and to construct general formulas and proofs of general theorems. The basic concepts and quantum mechanical fundamentals (reduced density matrices, entanglement, quantum correlations) are discussed in a comprehensive way. The discussion leads up to applications like coherence and orientation effects in atoms and molecules, decoherence and relaxation processes. This third edition has been updated and extended throughout and contains a completely new chapter exploring nonseparability and entanglement in two-particle spin-1/2 systems. The text discusses recent studies in atomic and molecular reactions. A new chapter explores nonseparability and entanglement in two-particle spin-1/2 systems.